Each day aboard the yacht will bring new sights, sounds and experiences. You will encounter many different animals and a variety of landscapes, and hopefully learn something new every day. However, life on the boat will follow a distinct rhythm. Awake to the sounds of music being piped into your room just as the sun is rising over the horizon. During the hottest times of the year, February and March, you usually go ashore soon after 6:00 AM and return for breakfast around 9:30 AM. This way you will be back aboard the yacht when the temperatures rise. During the rest of the year, you will have breakfast around 6:30 AM and head ashore before 7:30 AM. The order of the activities will be seasonally adjusted. 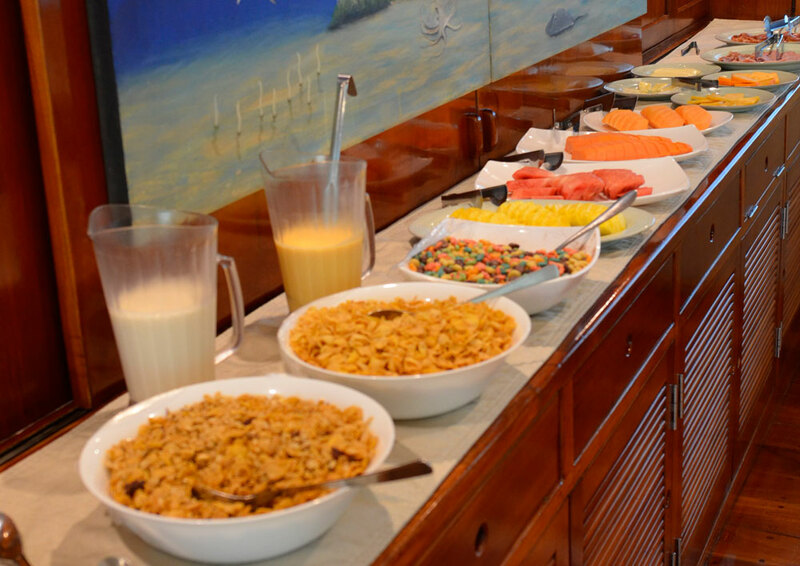 Start each day with a complete breakfast including fresh fruit, a selection of cereals and breads, eggs made to order, fresh-squeezed juice, and coffee or tea. While you enjoy breakfast your guide will take a moment to explain what the morning’s activities will bring so you can plan accordingly with appropriate footwear, clothing and camera equipment. The order of the activities will be seasonally adjusted. A 5-10 minute panga ride brings you to shore for either a wet beach landing or dry dock landing. Walks on land present a variety of terrains: sandy coves, tide pools, lava flows, uneven rocks, steep steps and earthen paths to name a few. The walks are taken at a leisurely pace allowing plenty of time for bird watching, taking pictures, learning about your surroundings, and simply listening to nature. Return to the boat for a snack and a short break. 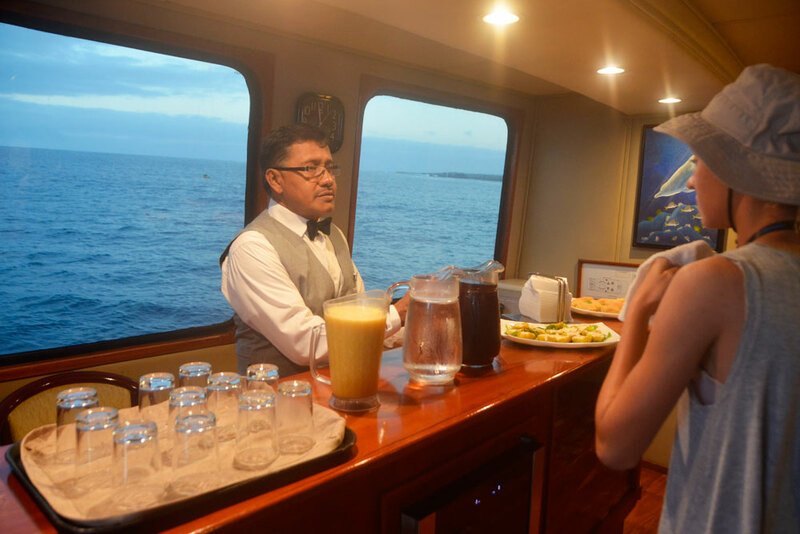 Since there is absolutely no food allowed on the islands, you are always greeted back aboard the yacht with a tasty selection of snacks and time to relax. Snorkeling is one of the highlights of any visit to Galapágos. The group usually snorkels at least once every day for approximately 45 minutes to an hour and may even have two opportunities to snorkel in one day. Swim with sea turtles, sea lions and penguins. Watch schools of yellow-tailed surgeonfish feeding on the algae. Perhaps catch a glimpse of a spotted eagle ray or a mola-mola (giant oceanic sunfish). Observe the unique pencil-spined urchins and chocolate chip starfish and other fascinating invertebrates. If you've never snorkeled, you'll want to practice before you arrive so you don't miss out on this exciting and rewarding aspect of the trip. The afternoon meal is the most important meal of the day in Ecuadorian culture. Lunch is a sit-down event with several courses. The meal always starts with a salad or a traditional soup, followed by a hot entrée and dessert. On days when you visit two different islands, the yacht will be in transit for a few hours mid-day. You can use this time to take a siesta, read one of the Galápagos-themed books from the library on board, download and review your images, write in your journal, or just enjoy the view and the refreshing ocean breeze on deck. It’s also a good time for whale and dolphin-spotting. If the yacht is not traveling to another island for the afternoon landing, this time can also be used for water recreation, swimming or kayaking or a second scheduled snorkeling excursion. You will once again take the panga to shore for more explorations along marked trails. Terrain, vistas, and featured birds and animals will vary. According to park rules, all visitors must be off the island by 6:00 PM, just in time to enjoy the sunset from the top deck with a beverage in-hand. Your chef takes special pride in creating fresh, healthy meals. You dine on a variety of entrees throughout the week featuring chicken, meat, pork, and fish. The chef also enjoys planning special meals or desserts if the trip falls on a holiday or special event. Evenings are used for talks and lectures on subjects relating to the islands. Climate, oceanography, formation of volcanic islands, human history of the islands, plate tectonics, species of the Galápagos Islands, and Darwin’s theories of evolution are all possible topics. You will aslo have time to review the birds and animals that you saw during the day or preview what you should anticipate for the next day. There is a DVD/CD and LCD monitor in each stateroom for watching movies from the yacht’s small video library or even for viewing your own videos and digital pictures. Remember to bring your camera patch cord and battery charger. You are free to retire to your cabin as early or as late as you wish. The crew often pull up anchor shortly after dinner to travel to the next harbor by morning. On nights when less distance is to be covered, the boat might not set sail until 10:00 or 11:00 PM. The next day you awake to the views of a new island that awaits exploration.